The Aerotank boasts a sturdy Pyrex glass tank and the V2 is no exception. Not only does the new V2 come with the aforementioned Pyrex glass tank, it also comes with a stainless steel tank. This stainless steel tank gives you the option of added durability and is used IN PLACE of the glass tank and is not a cover to use with the glass tank. The pre-existing airflow valve has been redesigned, making it easier to control the airflow getting to the coil head. Simply twist the dial beneath the tank from left to right to give yourself more or less airflow, depending on your preferences. When adjusting the dial, hold onto the base to ensure that you don't unscrew the clearomizer from your battery. Another great thing they've revamped is the coil heads. The wicks are now located inside the atomizer. This is a new feature that helps to prevent leaking. The Aerotank V2 is still glue free and can be completely disassembled for cleaning and rebuilding purposes. Its tank has a 2.5ml capacity, the drip tip is replaceable with any 510 drip tip and the clearomizer itself is 510 threaded to fit on any eGo battery. Though it will function on any eGo battery it is recommended to use one of the larger batteries with more power so that your Aerotank V2 will meet its full potential and wow you with its ability. 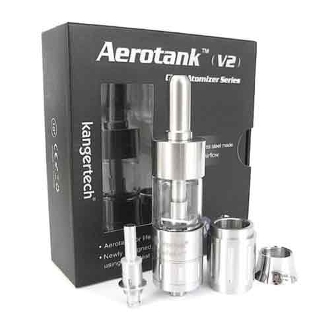 Turn the Kanger Aerotank upside down and unscrew the base assembly cap from the bottom of the tank. Fill with approximately 2.0ml-2.4ml of e-liquid by tilting the Kanger Aerotank at a slight angle and dripping juice down the inside wall against the outer wall of tank. Let the AeroTank sit for a few minutes when first filling with liquid, this will allow the liquid to absorb into the coil wicks. Firing the Kanger AeroTank with a dry coil can cause burning of the wicking material and possibly ruin the coil. The metal tube in the center of the Aerotank runs strait through the clearomizer, so avoid getting liquid into the tube, otherwise leaking may occur.